are not part of an international volunteer organisation but rather a group of Swazi's who have put together a collection of volunteer programmes that truly help the people of Swaziland. 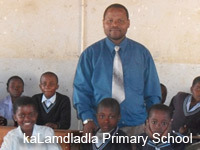 Having spent their entire lives- living, breathing and loving Swaziland- they ensure that all programmes are extremely beneficial to the communities and people of Swaziland. Volunteers for all projects live at either the backpacking lodge outside Manzini or in the rural village of kaPhunga. All volunteers experience Swaziland together on various excursions. This ensures Volunteers not only meet the real people of Swaziland but also other volunteers from around the world. Swazi Volunteers have the best programmes in place to help you experience rural Swaziland whilst making a real difference to the Swazi people. is a landlocked mountainous Kingdom bordered by South Africa and Mozambique. The population is estimated at 1,000,000. 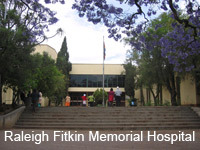 It has the highest prevalence rate of HIV and AIDS and TB in the Southern African region and the world. Approximately 70% of the population live in poverty with the majority of those being in rural areas. Many communities still do not have access to electricity and safe drinking water and the number of orphans and vulnerable children (a direct consequence of the HIV and AIDS pandemic) is estimated to be around 130,000. With 500 children ,219 of whom are orphans, volunteer to teach English. 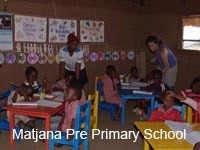 In an area with no running water or electricity -Matjana provides education. Why Swazi Volunteers is a unique opportunity for you? * Your Host is a true Swazi who will give you the best insight of the Swazi people. * Your stay is deep in the village of kaPhunga about 55kms from Manzini the nearest town. * You will be staying in Swazi traditional huts and enjoying the experience of a lifetime. * You will be encouraged to speak the language since it’s very useful. * In some projects you will be working with the community e.g. the school building projects.